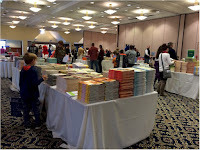 I'm doing a summary of my writing on last weekend's Connecticut Children's Book Fair, so I can share it at some platforms where I didn't use the individual posts. I attended a NESCBWI event today, so, yes, it's time to move on to other things. How Great Was This Year's Connecticut Children's Book Fair?